A mother of four with a full-time job, Katrina Anderson talks this episode about an array of topics, ranging from strategies for managing her life, to time management, personal strengths and weaknesses, grocery shopping, facial expressions, and many places in between. First listening to ADHD reWired as a mother looking for tips to help raise her son, Katrina is now a guest helping others with her relatable stories. Katrina balances raising her four children, her full-time job, and her ADHD. Katrina has a pair of twins who recently turned one, a seven-year-old, and an eight-year-old. Her seven- and eight-year-old children were both recently diagnosed with ADHD. Diagnosed with ADHD at a young age, Katrina came to listen to ADHD reWired while searching online for help so that she could better raise her son. 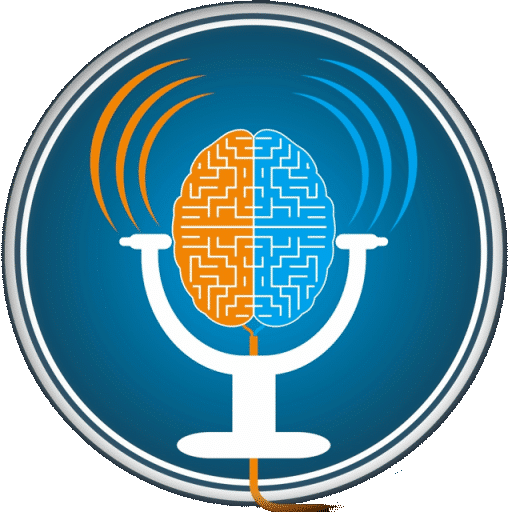 Eric decided to attempt podcasting after finding and listening to older podcast episodes from a man named Jerry Seiden, who told stories of his history of addiction, recovery, and having ADHD. Hearing stories from relatable people was a major reason Katrina decided on ADHD reWired. 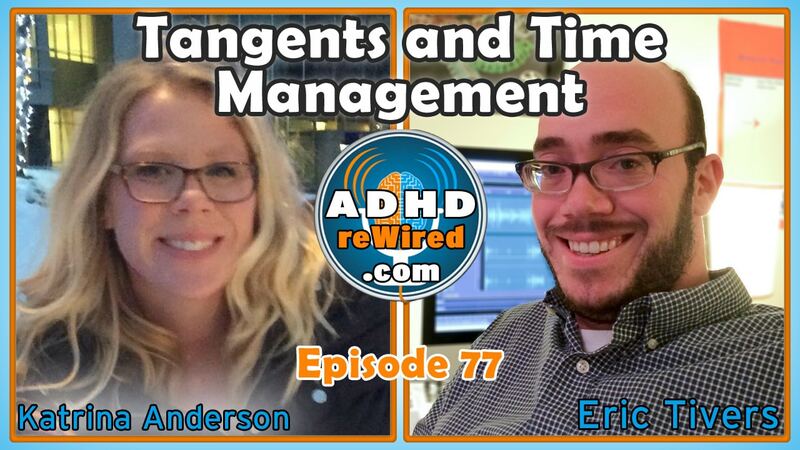 Eric mentions newer ADHD-related podcasts, like ADHD Mumbo Jumbo and The Tom Nardone Show. A big fan of technology, Katrina uses her phone, tablet, and the calendar synched between them extensively. Katrina previously worked at an Apple store (though she now has trouble using her iMac). After noticing gibberish entries being synched to his calendar, Eric made sure to add password protection to prevent his son from editing it. Katrina mentions how small technology problems can lead to hours of distraction not actually pertaining to solving the problem. Katrina uses the calendar in Outlook alongside Evernote for much of her task management. When friends contact her to meet up, Katrina asks them to send her calendar invitations to make sure she can schedule the time. 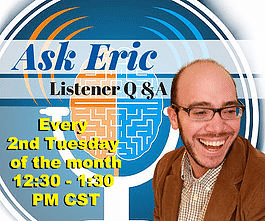 Eric notes that he directs new and prospective clients to his website and its scheduling service specifically because of how much more arduous of a process it is to talk otherwise. As she receives notes throughout the day, she adds them to her Evernote account and uses them in conjunction with their time stamps as a to-do list..
Each one of Katrina’s customers is managed within their own Evernote account. To further categorize calendar tasks, she uses a regular notebook to write down those that she needs to accomplish in a given day. As mentioned in episode 75, despite using an online calendar and doubling that schedule over to his notebook on a daily basis, Eric forgot to check his notebook for a short period, which resulted in a patient showing up at his door suddenly. The patient was on time, but Eric initially told him he was early. Eric is currently listening to an audiobook of Procrastinate on Purpose. Author Rory Vayden adds consideration for ‘significance’ when deciding upon the priority and creation of tasks – this is in addition to the regular ‘importance vs. urgency’ matrix proposed by Steven Covey. He uses significance to describe the length of time for which the task will have a significant impact in the future. Initially looking for self-help audiobooks after being drawn in to the concept on ADHD reWired, Katrina has more recently begun listening to fiction and storytelling books, like those from Stephen King. 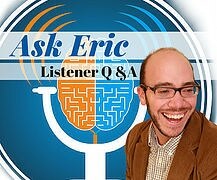 From both production quality and storytelling perspectives, Eric considers The Art of Asking to be brilliantly executed. Author Amanda Palmer uses her experience as a musician to enhance the audiobook’s content. Katrina laments how she can become so interested in the audiobooks she is listening to that they can distract her from preparing for her work. Creativity may be one of the strengths of those with ADHD, but the challenge is being able to finish and complete one’s creative goals. In pursuing her goals prior to finding ADHD reWired, Katrina developed her own systems to help with organization and productivity. Surrounding herself with other people and friends who had strengths she lacked was one way she maintained productivity. Katrina: It’s always good to have others to hold you accountable or to whom you can delegate tasks. Using their family calendar and splitting up tasks helps Katrina and her husband better manage their family tasks. They also hire a house cleaner once per week, which Katrina calls a “saving grace”. Growing up, Eric used to think his parents’ choice to hire a house cleaner was a luxury, but now realizes it was an accommodation they made for productivity. If he didn’t hire a cleaner, Eric says he would probably spend an entire weekend or more hyperfocused on small details. Prioritization plays a large part in Katrina’s ability to manage her time. She uses an ‘importance vs. urgency’ matrix while additionally taking into account the financial side of decisions. Setting timers has been useful for Katrina. She will set impromptu time limits for tasks to increase their perceived urgency. When taking power naps, Eric suggests holding keys in your hand; when the keys fall out and hit the ground, the nap is over. When she puts her mind to it, Katrina can be on-track with her diet and exercise, but as soon as she begins to slip away from smaller elements, it’s then a slippery slope to when she soon has broader issues. In job interviews, when asked about her greatest opportunity, she responds that both her greatest strength and opportunity is her ability to be organized. It may be challenging for her, but it also pays off when she needs to use it. Eric points out that because of the necessity of novelty for those with ADHD, any system or strategy put in place will have a “shelf life” of sorts, after which it will decrease in effectiveness due to a lacking ability to hold one’s attention. The need for constant stimulation can cause her to, for instance, buying a new string trimmer and only using it for one season. Katrina lists public speaking as one of her fears. On the other hand, Eric feels energized when presenting in public – it’s the planning and preparation to create an entertaining presentation that really stresses him out. Telling stories has sometimes been problematic for Katrina; she says she usually diverts from the original direction mid-way through. When visiting a new workplace for the first time, Katrina is at ease and has no problem talking with and making friends with virtually everybody. However, place her in front of a group of people in a situation where she is the center of attention and she will freeze up with tremendous anxiety, with subsequent anxiety attacks for moths afterward. When she struggles to do tasks that look so simple to others, Katrina becomes frustrated and flustered. She has been trying to stop using the word “just” when describing tasks like these. Buying groceries, for instance, is a challenge for both Eric and Katrina: they are at risk for spending upwards of three hours in the store. Peapod, a grocery delivery service, is what Eric says he would probably use if he had to manage groceries himself. Some brick-and-mortar grocery stores are starting to support online ordering and pick-up orders. Recently working on a two-day workshop and presentation for faculty at his son’s school, Eric is running into issues of having to manage his perfectionism. People who tend to pair a facial expression with an emotion (smiling and feeling happy, for instance) can try to make use of that facial expression to trigger the emotion. Katrina tells of how, when appearing for a mock job interview, her face appeared mad or angry to the interviewer without her realizing it. Eric: Many don’t realize what their neutral resting face looks like. For children, those with neutral resting faces appear positive tend to have more friends than those whose appear to be negative. While a person’s neutral resting face may initially be formed unconsciously, they can take conscious control of it through feedback from other people. You are about deliver a pitch to a pharmaceutical company who you would like to buy your invention. What is the invention called and how would you sell it to them? What meal would you prepare or have prepared for you if you had the opportunity? 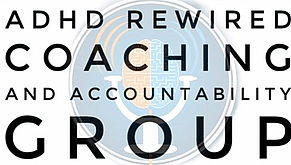 Katrina is a member of the ADHD reWired Community Facebook group.